Positives: Form: As has been the case with a number of Crows players, Matt Crouch has endured a frustrating 2018 as a result of his injury problems, which has seen him miss four weeks of football. Matt kicked off the year is fine form, racking up 123 on the Bombers before unfortunately succumbing to a hamstring complaint just after quarter time against the Tigers, whilst he was on 33 (from just 23% time on ground). His disposal numbers are always high, and this is where Matty Crouch gets the overwhelming majority of his points from. Finding the ball will never be an issue with Crouchy. Nine hundreds in eleven games suggests he is in pretty good nick. Consistency: Despite his stints on the sidelines with injury, Crouch has still managed to put up some pretty consistent scores. He has dropped under 90 just once (disregarding his injury-affected 33) and, on-top of that, has recorded eleven total hundreds, including scores of 120, 121, 123 and 134. His consistency was elite last year and, although injuries have threatened to prove a disruption, it has been maintained through this season as well. Negatives: Better Options: There aren’t very limited concerns attached with Crouch, making this section a difficult one to navigate. He is super consistent so you know what to expect from him week-in-week-out. His form line since returning from the hamstring complaint has been strong and his ceiling, although perhaps not as high as other premo midfielders, is still high enough. Could an argument be made to suggest that their are better options available for a similar price, like GWS’ Stephen Coniglio, Bulldog Lachie Hunter or, St.Kilda’s Seb Ross? Not exactly a strong negative, however it’s something to ponder for those dedicated coaches who’ve lasted this long. Positives: Ceiling: Over the course of his 100-game career, and in-particular his previous two seasons, St.Kilda on-baller Seb Ross has demonstrated a strong ability to be able to rack up plenty of the touches on a regular basis. A big tank and high work rate allows the 2011 second-round draft pick to roam around the ground and rack up the disposals to a point where he is now St.Kilda’s best midfielder. The previous two weekends provide coaches with a pair of perfect examples as to what Ross can piece together if allowed to run free. Against the Bulldogs, Seb scored 160 points from 22 kicks, 18 handballs, 9 marks, 3 tackles and 3 goals. Then as recently as Friday night, Ross collected another 43 possessions, 7 marks and 4 tackles in what was another well-rounded performance, this time yielding a score of 143. Earlier in the campaign he managed scores of 121 (x2), 123, 132, 133 and 137 – further highlighting Ross’ high ceiling. Uniqueness: Although he has been in the system since 2012 and recently notched up his 100th AFL game, Seb Ross is only just capturing the attention of the broader footy world away from St.Kilda’s Linen House Centre. After averaging 98 and 102 in ’16 and ’17 respectively, Ross has elevated his game up a notch or two this year (averaging 106 points per game) in what has been a disappointing one for his club. Not yet renowned as a premium Fantasy midfielder, Ross’ ownership levels have managed to stay below 3% for the entire campaign. It currently sits at a mere 2.5%. Negatives: Consistency: Whilst Seb Ross’ ceiling has been the major reason for his strong 106-point season average, his consistency has let him down at various stages and prevented him from going to an even higher level. With ten tons under his belt, a tally of seven scores under-90 is frustrating. During the early-to-middle part of the year (rounds 4-16) – a huge chunk of the season – Ross’ struggle for consistency was highlighted. He managed four scores of 120+, however his eight sub-100 efforts saw many coaches deem him an nonviable option to have slotted into their midfield. Since he missed the round 17 victory over Carlton, Seb Ross has pumped out four consecutive tons, however if his statistics from earlier in the season are anything to go by, should Ross be trusted at such an important time of the Fantasy year. 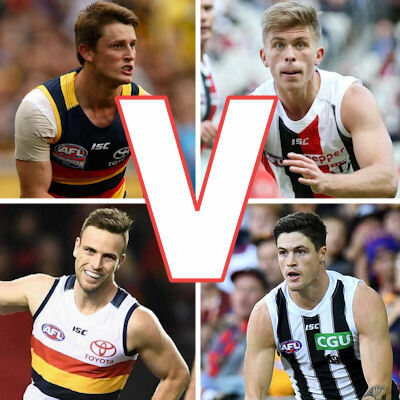 Verdict:The Saints and Crows won’t feature in September, however Matt Crouch and Seb Ross are two midfielders who could be more than serviceable in Fantasy finals. With these two, its a case of whether you value consistency/reliability or ceiling. Although Crouch is the safe option, Ross’ ceiling and uniqueness are greater assets at this time of the year, at-least in my eyes. Positives: Uniqueness: It’s no surprise to see Brodie Smith’s ownership percentage so low. After all, he is just two game back from an ACL injury which saw him miss the Crows finals campaign and 95% of the 2018 season. However, no one is doubting the former All-Australian half-backman’s ability to eat up the metres with ball in hand. After his impressive performance on the weekend, could Brodie Smith loom as the left-field wildcard to help you in the latter stages of Fantasy finals. Fixtures: The Crows, although out of finals contention, do have a couple of easier fixtures to round off a severely underwhelming year. This weekend they host a North Melbourne side whose finals aspirations were all but dashed by the Western Bulldogs. North are ranked 12th for points against but middle of the pack for 120’s and 100’s conceded. Adelaide cap things off with one of the easiest fixtures possible – Carlton at Etihad Stadium. The wooden spooners sit 17th for points against, 15th for 120’s against and 10th for 100’s against. Smith should be expected to make the most of these final opportunities against two of the lower ranked sides in the competition. Value: Smithers hasn’t ever accumulated enough of the ball on a regular basis to make him a genuine point scoring premium defender. However given his seamless transition back into the AFL scene and the supposed lack of many genuine D6 options, Smith could be of some value at $539,000. Negatives: Can He Be Trusted? : There is certainly a risk attached to selecting Smithers. Obviously his horrific ACL injury is at the back of our minds, however surely it isn’t an issue. He will no-doubt benefit mentally and physically from returning for the final month of the season and the Crows won’t put him on ice as a result. There is cause for concern if you look at some of the numbers he has put up over his career. Smith’s best year yielded a season average of 82 from 22 home and away games. The previous three years he’s placed in the 70’s. So whilst we’re speaking of trading him in for a short period, can he be trusted to do the job after such a major injury and limited runs of the board? Positives: Form: Jack Crisp hasn’t set the world on fire this year, however his scoring has been steady throughout. Against the Swans and Lions, Crisp has managed to get his hands on the ball more regularly and get back to taking an abundance of marks around the ground. He has managed a combined 55 disposals across the last fortnight with 12 marks and 9 tackles also notched up throughout this period. Earlier in the season, four of his five hundreds prior to round 19 came in a consecutive stretch. If the Magpie utility is able to replicate that again to finish of the minor round, he becomes an obvious choice at D6. Ceiling: Jack Crisp has the rare ability to be able to play in just about every position on the ground. He has been tried through the midfield and up forward in years gone by, however his clean foot skills, strength and overhead marking favour a role along the Magpies half-back line. A frequent contested ball winner whose tall frame and tackling strength saw him given run-with roles from time-to-time, in 2018 Crisp has been strong down back, averaging 88 points. In the Magpies round eight loss to Geelong, Crisp was everywhere, collecting 32 disposals (20 kicks, 12 handballs), 7 marks, 11 tackles and 147 Fantasy points. He has gone 110+ on four occasions. Fixtures: Collingwood finish their home and away season with clashes against a wounded Port Adelaide (MCG) and struggling Fremantle (Optus Stadium). The Power, admittedly, are ranked highly for points conceded in the past three weeks, but drop into the bottom five for 120’s and 100’s against. For the season, Fremantle rank 16th, 14th and 11th for the three key indicators. Negatives: Consistency: After scoring just one ton in the first seven rounds of the year and failing to hit triple figure for seven straight weeks up until recently, there has to be some doubt cast over Crisp’s consistency. Typically, when Jack Crisp scores well, he is taking plenty of uncontested marks. In his seven total tons, Crisp has notched up a combined 54 marks. He has collected more than 6 marks and stayed under 100 just once. This statistic should be seen as his barometer. A ratio of 9 100’s and 13 sub-100 scores isn’t great, and nor were his scores from rounds 12 to 19 this season. Consistency is a bit of a dilemma. Verdict: I feel as if it would take a bold man to bring in Brodie Smith this week. He feels like a risk, given his recent injury and rusty return against the Power. However his performance last weekend in Canberra reminded us just how good the guy can be. Crisp, on the other hand has posted some bigger scores during the season and has hit some form at the right time. It has to be Crisp but wouldn’t Smith be a real wildcard. It will be interesting to see how DEF scores will be affected next year if the AFL changes the rules for backward kicking.